- Fashion Ecstasy on 二月 12, 2019. “Living in a bubble” is used to describe simple-minded people who are unwilling to accept the reality and choose to live in a sheltered world despite being able to see what’s going on in the real world, just like living in a bubble. I’m one of them. I am turning 32 and I still live in my bubble. I also believe in rainbows and unicorn. Thus, there was a special connection when I visited the “Hotel Poispois” in Taipei. The seeemingly petite hotel keeps up with the latest trend of a five-star luxury hotel, check-in reception is on the higher 10th floor. “Poispois” means “dots” in French, and because the pronunciation is close to “bubbles (泡泡）” in Chinese, the hotel is designed with bubbles and dots as a design concept. Besides just simply “bubbles,” the hotel adds colors to its design, making it even more like a fairytale, where I can reach my happy place. Hotel Poispois’ elevator is designed by award-winning German artist Peter Zimmerman exclusively for the hotel with colourful overlaying circles. The check-in room on the 10th floor features white marble floor with colorful round seats. The guest room features a transparent round bubble chair, the round design creates an echo when I sit and sing Disney princess theme songs in it, letting me completely immerse in my own bubbly world. The facade of hotel Poispois is designed with red and white oval shapes, the same as the colours of Canada, my hometown and my happy place. Colourful dotted LED lights light up Hotel Pois Pois‘ logo at the front door. The front door on the first floor is on the heavier side and is not automatic. It took me a while to open it. The Velvet Rouge on the second floor features mysterious red velvet interior, similar to a French burlesque bar, I add Velvet Rouge to my bucket list after a sneak peek. Unfortunately, both the bar and the restaurant on the first floor of the hotel were closed for Chinese New Years during my visit. Next time. Checkout is at eleven. I push it to twelve. The reception floor becomes paradise the next day because I discover the outdoor rooftop garden/patio that I missed in the dark last night. 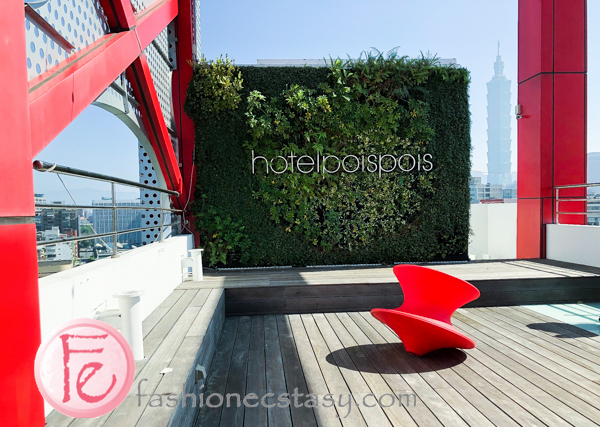 The patio has Hotel Pois Pois’ botanic selfie wall with the backdrop of Taipei city and Taipei101. It is the perfect selfie and Instagram spot. The spinning round red chairs calls for a challenge. The child in me accepts the challenge and ends up falling and flashing everyone. Sorry! However, the fun I get is priceless.